Here's my space. I did a little cleaning and organizing over the weekend, and I also did a little rearranging. My favorite area that I set up. I see this when I sit at my desk. I got this idea from Teri. I used a three tiered basket and wrapped my lace on clothes pins. Great space Christina! You don't want to see mine! Its still under remodel. I bought some things from IKEA that I'm anxious to get up but I'm waiting on hubby to finish painting and such so I can get everything back in order. Soon I hope. It's manageable though. TFS your space! I finally figured it out!! Don't laugh...I'm old! I'm still trying to master technology. My room is a MESS but it's even worse than when I took that picture. I'm impressed that you cleaned and organized but it isn't gonna happen here. Too much going on in the way of projects and way too much going on in the yardwork department! Neat room! I've got to get some clothes pins like yours, so cute! Love your room. I posted for the first time the last time you asked for a photo. 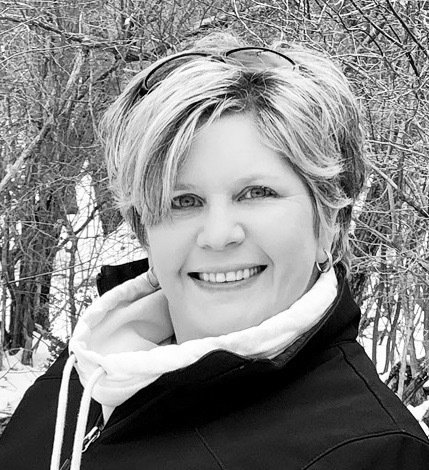 It was fun learning how to post a picture and I did it! Yea! 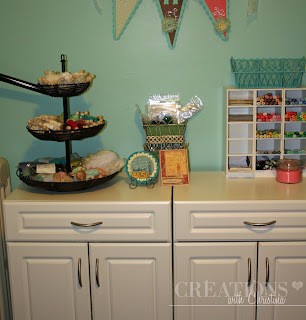 Christina- you're craft room is so pretty! It's like a dream. 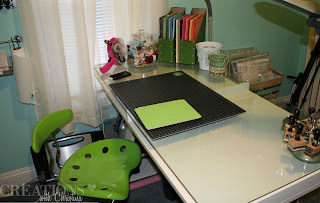 I love that Ikea desk I've seen other crafters use it. May have to get that one now. I love your craft space. 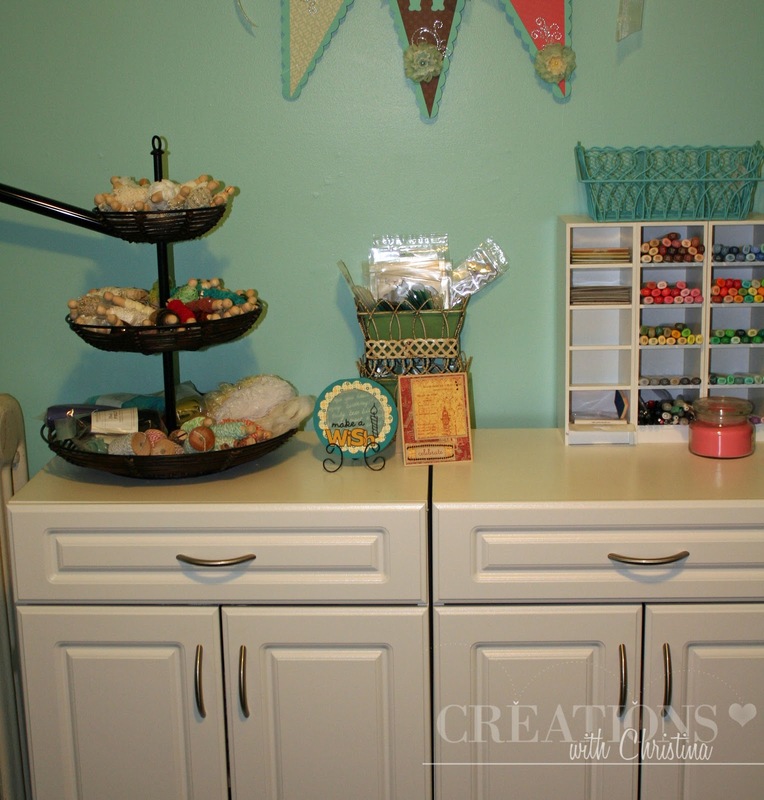 I have a room that is multifunctional but mostly it is a craft room. I have the same Ikea desk top but I opted not to buy the legs. I put the Ikea desk top on top of my sturdy table and it works great. I love having my cutter and score pad right there when I need them. I am too messy to ever share a photo. LOL! Your space is SO FAB Christina! I love it! I'm SOO Jealous! I can't show my space...it looks like a BOMB of craft stuff exploded in it! OMG these posts are making me feel so - what's the word? - UGH! My craft areas are parts of two areas in my basement, two work tables, a sprinkling of organizer drawers, a dresser, a multi-tier cart for stamps, and I won't go any further because it's so not pretty. I think no wonder it's a challenge to get anything done! LOVE what you've got. Love your space! Looks great!!! <3 the wall color so pretty! Very organized, and I <3 your desk :-) TFS! Love your space! It is warm and cozy with the pretty wall color. And it is very organized. 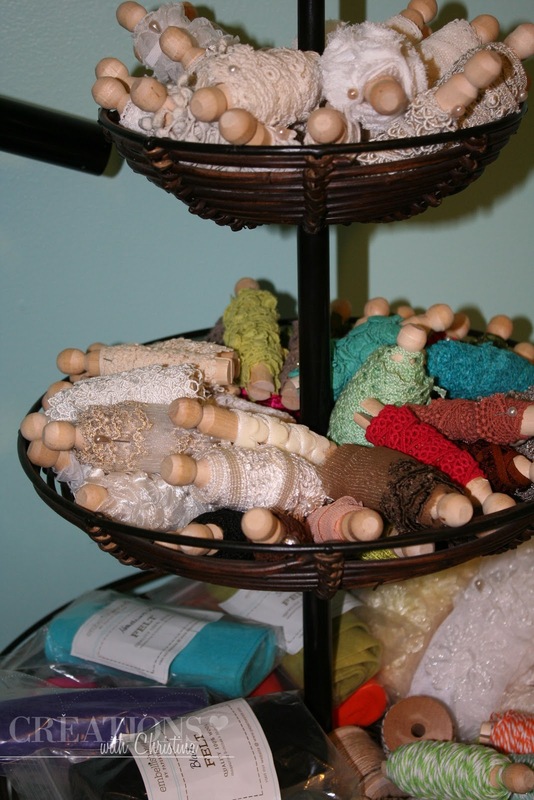 I love the clothing pin idea from Teri...would work well with ribbon that is not on a spool. Thanks for the fun post! Scrappy hugs! I would die happy in your room....ok that's a little creepy...HA HA HA. I also love my island table from Ikea.. well all my tables are from them..
Wow, some of you have some pretty fancy dancy craft spaces. Mine looks like a tornado came through and even after straightening things up......well still not so pretty.I still love to work in my mess though. Thanks for sharing. Beautiful space you have! I posted pics of my messy space last time and it's still just as bad, so I'm not posting that mess again. LOL! Wish it were nice and neat, but it just ain't gonna happen. I know me to well to think it will. ha ha ha ha. Thanks for hosting! I LOVE seeing other's craft spaces. 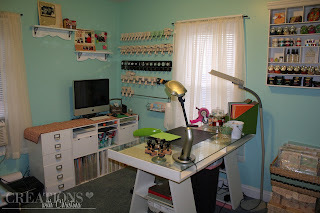 Love seeing photos of your craft room or as my hubby says of mine it my craft womb. I feel so comfortable in my room and I can see you would in yours also. Love the clothpen lace idea. I also keep my punches this way thanks for sharing. Awesome space. I have to wonder what is behind the doors of those cabinets, though....Must be all your PTI stamp sets. What are you ordering from this newest release??? Hey Christina where did you get your chair I've been searching for a year for one like that? I linked up my space. I am actually moving in 3 weeks so my space is going to change quite a bit very soon, LOL. Your space is absolutely beautiful! These kind of posts make me want to go shopping :) LOVE 'em. Your space is very nice!! !